In Hawaii, it's called "Ma'uka", and "upcountry". 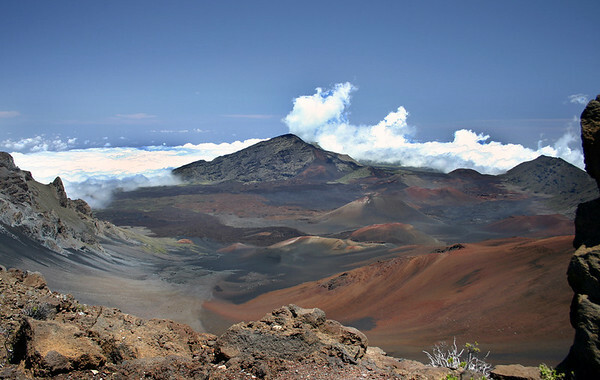 Clouds gather in the early afternoon as the Haleakala Basin heats up. In a short time,the entire basin will be obscured in cloud cover. Haleakala Crater viewed from the summit Visitor Center. The gray linear features extending downslope into the summit basin are debris trains and active slides, fine-grained material actively creeping downslope. 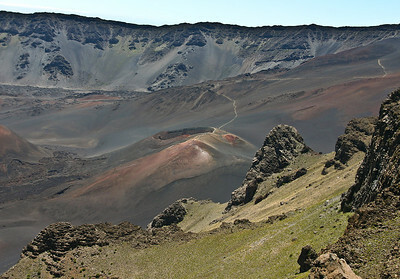 The view into Haleakala's summit basin from Kalahaku Overlook. The Sliding Sands Trail that leads down into the summit basin snakes uphill behind one of the recently-erupted cinder cones. 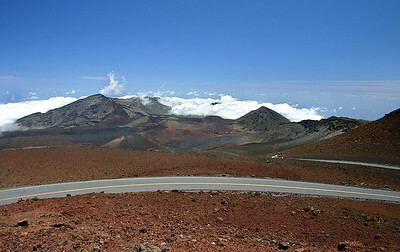 The last turn before the summit, Haleakala Summit Road. Watching the clouds roll in along the lower stretch of Haleakala Summit Road, south Maui. 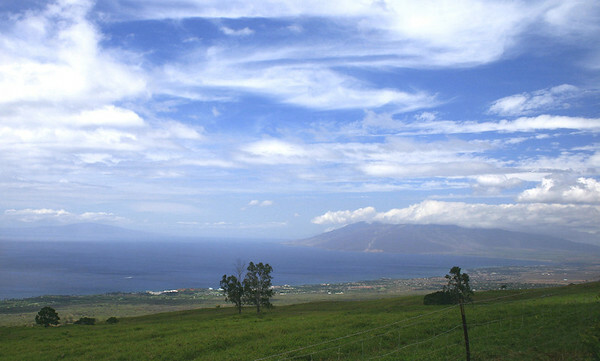 The view of Ma'alaea Bay and the West Maui Mountains (center-left part of frame) from the Pi'ilani Highway just south of Ulupalakua Ranch. The white structures just downslope along the shoreline mark the southernmost extent of the community of Makena, south Maui. West Maui Mountains on the hazy horizon. Lana'i can be seen on the distant horizon, left side of photo. 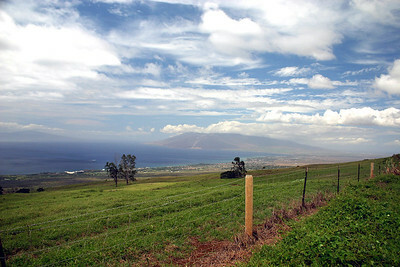 Shot taken from the roadbed of the Kula Highway, near Ulupalakua Ranch, south Maui. The southern slopes of Haleakala volcano (the rim of the summit basin is visible in the center of the photo, just above the cloud bank) are the awesome backdrop for St. John's Catholic Church near Kaupo on the Pi'ilani Highway, south Maui. 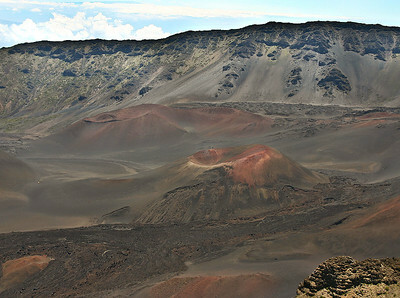 This image is a composite of five separate photographs of the ridgeline that forms the volcano's south rim. Looking northward across the churchyard of St. John's Catholic Church toward the south-facing slope of Haleakala volcano, near Kaupo, south Maui. My trusty Toyota waits just outside the churchyard near an incongruous squeaky metal turnstile. To my way of thinking, this is an appropriately awe-inspiring setting for a humble parish church. 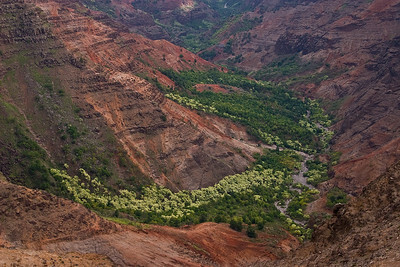 The view upstream in Mokihana Valley, a branch of Waimea Canyon, west Kaua'i. 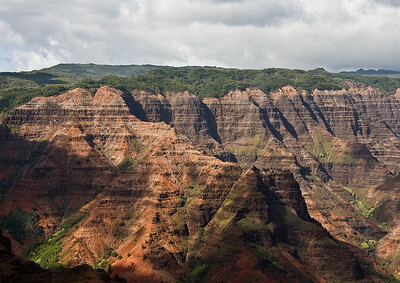 The steep cliffs along the west bank of the Mokihana River (bottom-center portion of photo) are the remains of the west scarp of the Makaweli Graben, a trough-like feature that dropped down between a pair of immense faults associated with the early collapse of the Wai'ale'ale shield volcano the formed Kaua'i. 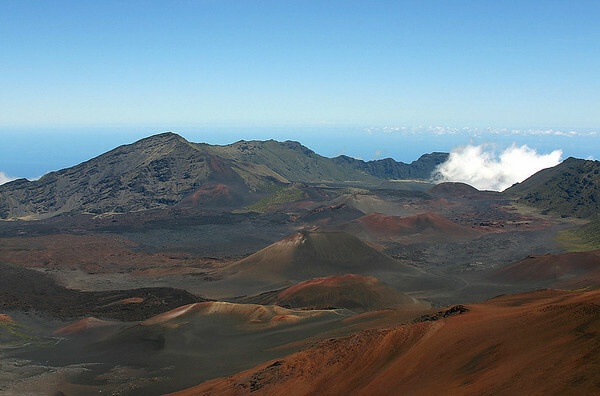 The long ridge on the horizon (upper-left quadrant of photo) is Kumuwela Ridge, the leading edge of the Olokele Plateau, a remnant of the original slopes of Wai'ale'ale Volcano. 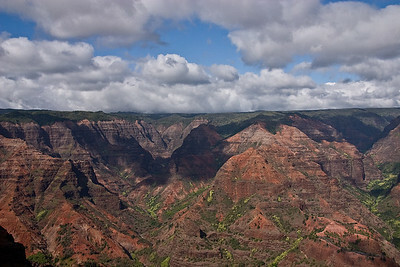 View of Waimea Canyon from an overlook along Highway 550 (across the canyon from Pu'u Ki), west Kaua'i. 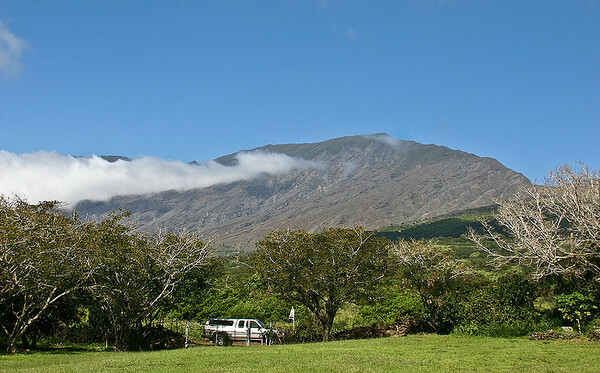 The highest point (just above the tree line in the upper third of this photo) of the fin-shaped protrusion of stratified volcanic rock is known as Pu'u Ki. It is more than 1,600 feet above sea level. The relatively flat surfaces of the buttes and small plateaus that form the skyline in this shot are probably the remnants of the paleosurface that predates the down-cutting action of the Waimea River and its many tributary streams. 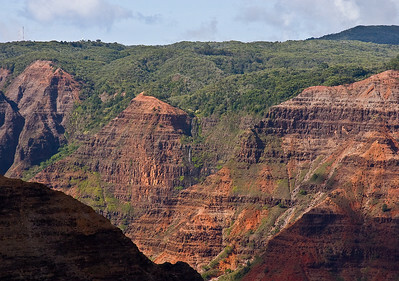 View of Waimea Canyon from an overlook along Highway 550, west Kaua'i. View upstream into Waialae Stream, one of the drainages that originates in the Na'pali-Kona Forest Preserve and flows into the Waimea River. Heavy vegetation in the canyon bottom (bottom-center of photo) is the site for Poachers Camp. 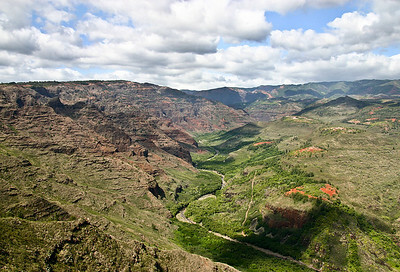 The nearly-flat topography of the skyline marks the paleosurface (current altitude more than 4,000 feet) that predates the down-cutting of the Waimea River and its tributaries. 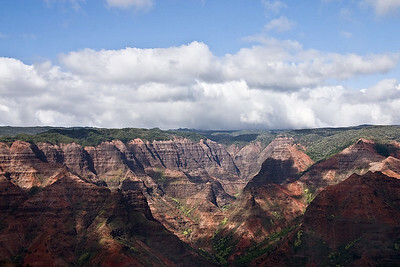 View of Waimea Canyon from an overlook on Highway 550, west Kaua'i. The confluence of Po'o mau Stream and Waiahulu Stream, both of which flow into the Wailea River (just out of the picture to the bottom right). 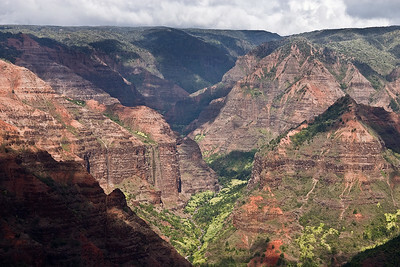 Near the head (northern terminus) of Waimea Canyon, west kaua'i. 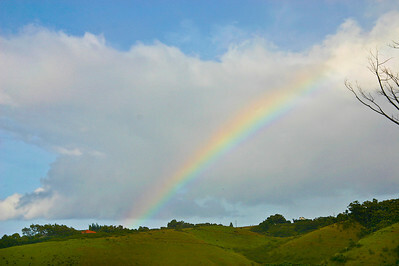 An early morning rainbow, Kua Road, upper Lawai Valley at Hale Kua, south Kaua'i. 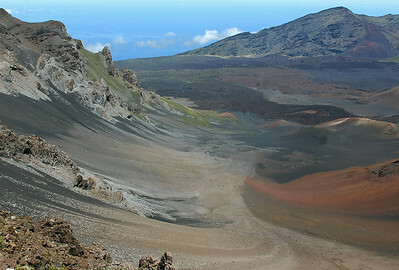 A close-up of one of the recently-erupted cinder cones in the summit basin of Haleakala. The Sliding Sands Trail snakes up and down the summit of the cone. Haleakala National Park, south Maui. Haleakala'a Summit Basin (from the Visitor Center) -- Looking down into Pu'u Ula'ula Crater, the cinder cone formed by the last volcanic activity of Haleakala. The different colors of the cinders is caused by oxidation (basically "rusting") of the cinders and other finer-grained materials of the basin. Volcanic "bombs" more than a meter in diameter litter the lower slopes of the basin; these were explosively thrown out of the erupting cinder cone. 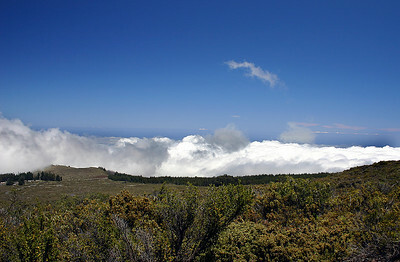 Clouds encroaching on the eastern rim of the crater rim and the Haleakala Summit Basin. Haleakala National Park, south Maui. 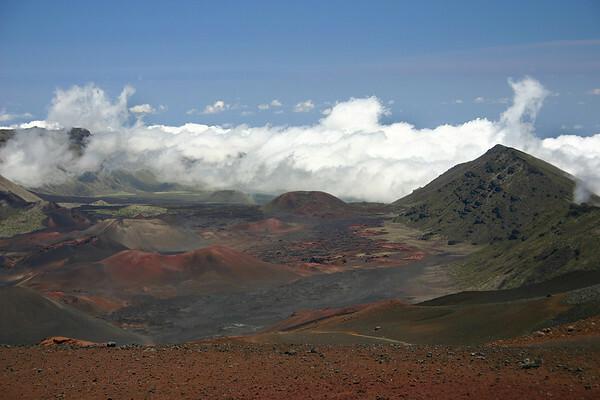 The view (from Kalahaku Overlook) of the western rim of Haleakala's crater and two cinder cones located in the summit basin below the rim. 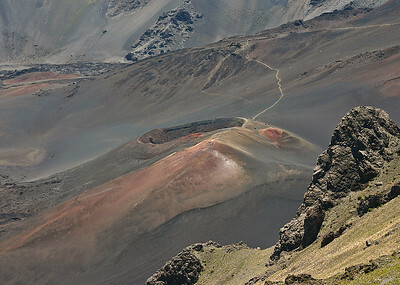 The multicolored ash deposits and darker lava flows mark the most recent volcanic activity with Haleakala's summit basin. 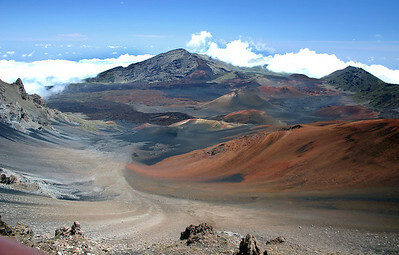 An excellent morning view (looking out from the western rim of the crater) of Haleakala's summit basin on a clear day. The cinder cones and lava flows of the last eruption in the Summit Basin are clearly visible. Haleakala National Park, south Maui.